BHA Tenant Volunteers contribute to funding a new defibrillator in Duns. Berwickshire Housing Association (BHA) Tenant Volunteers is one of several groups helping to finance the provision of a defibrillator to be sited at Duns Rugby Club. At BHA’s head office last week, Duns Rugby Football Club (DRFC) medic Stevie Wood accepted a cheque for £500 from Tenant Volunteer Rodney Short. Located on the gable end of the DRFC clubrooms, the public access defibrillator and trained personnel will provide a readily available emergency response to an out-of-hospital cardiac arrest within an area of Duns that often has large numbers of staff, players, and spectators alike, all within a sports hub and school environment. The defibrillator will serve not only the rugby club but also the swimming pool, football club, squash and racket club and the primary and high schools. 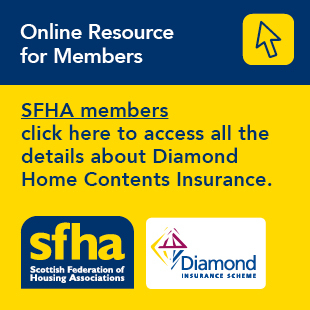 For further information about BHA, visit www.berwickshirehousing.org.uk. Pictured: Stevie Wood (left) accepts the cheque from Rodney Short.